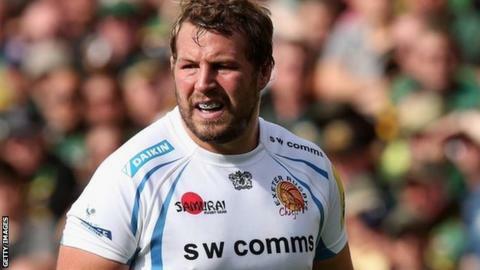 Exeter Chiefs prop Brett Sturgess has agreed a new one-year contract to take him into his ninth season at the club. The forward, 33, arrived at Sandy Park from Irish province Connacht in 2007. "To be competing at the top level, clubs need to have a big, quality squad and that's what we're building here," Sturgess told the club website. "This year it's taken a bit longer than normal to sort things, simply because it was more about understanding the role I'm going to play moving forward." Sturgess has played 166 games for the Devon club, some of which came before they were promoted to the Premiership, scoring ten tries in the process. "It's been tough this year not playing as much as I would have liked, but you have to give credit to Moony (Ben Moon) and Rims (Carl Rimmer)," Sturgess added. "Personally, I'm chuffed to bits to be staying and so are my family." Rob Baxter's side have all but guaranteed European Champions Cup rugby for next season and could yet finish in the Premiership's top four. "It pretty much finalises our front-row signings now," said Baxter. "We are expecting a lot from Brett, both on and off the pitch next year, and I know that is what he is expecting as well."